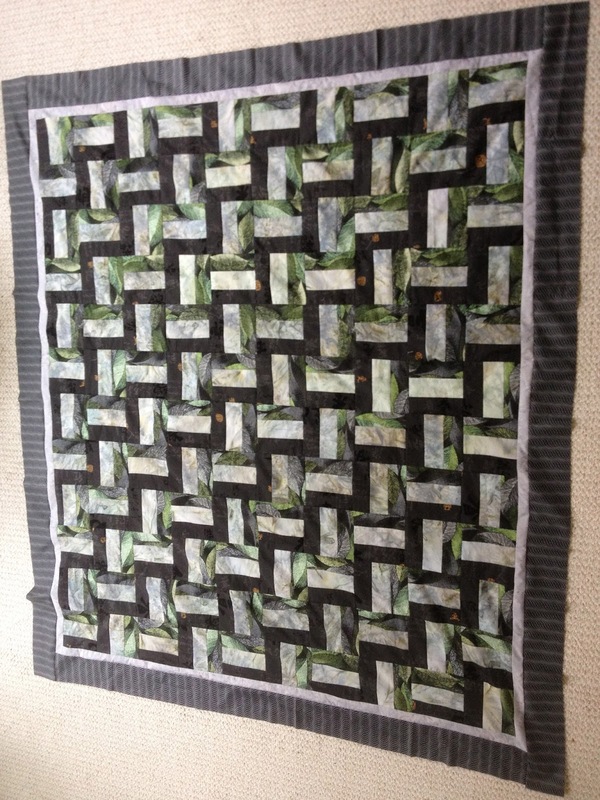 Explorations in Quilting and Life: Taking a Break .....well, sort of. In the meantime, I decided it was time to get in gear for our GVQC's new year which begins in September. I took a year off last year from contributing to the Comfort Quilt project. There was just too much on my plate with my new travel schedule etc. But, one year is enough time off! So, with Labor Day looming and three full days at home with no big activities planned (well almost none), I decided to start a comfort quilt. I found a pattern at e•Patterns Central that was fairly easy to follow. Of course, I used my own color selection and altered the borders a bit. However, by Tuesday I had the top pieced. 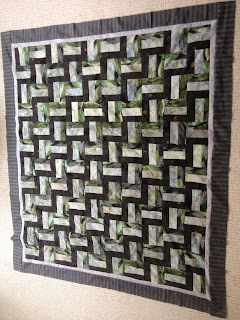 Here is a close up of the block layout and some of the border. I used another fabric with wavy black lines for one of the borders. I had bought it a while ago, thinking I might use it in a penguin image. I haven't gotten to that project yet. :) However, I thought it complemented the lines in the leaves nicely and worked well for this border. My goal now is to complete the quilting and hand the finished quilt in this fall. I have set a goal of two more creations during the guild year. I have linked this post with Nina Marie's "Off the Wall" Friday blog so check out what others have been up to. I thought I was the only one that liked a nice easy pattern to take a rest from designing! I don't know if I ever got to tell you but I loved loved your pieces at Sacred Thread - they were much better in person - really quite breath taking! 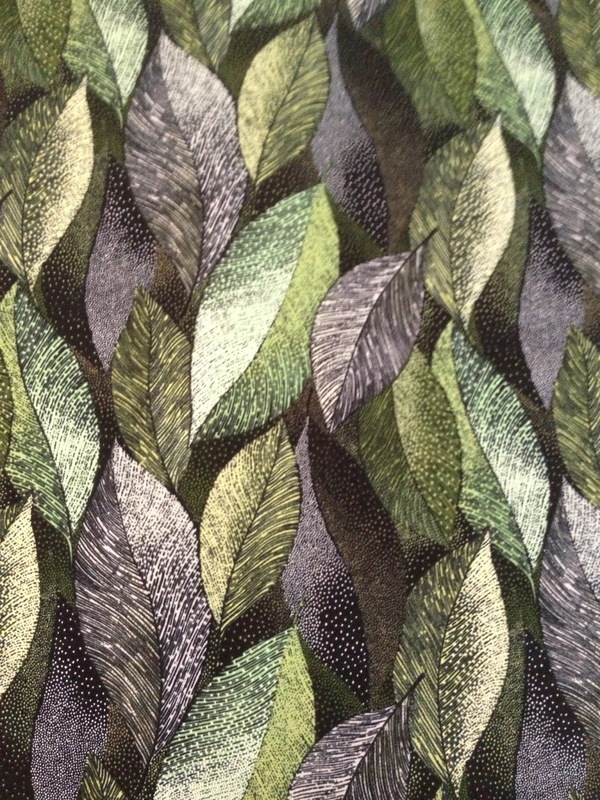 That great leaf fabric turned a simple pattern into a winner. Lucky person who will be the recipient! The choice of the green leaf fabric certainly makes the rail fence pattern far more interesting and complex....excellent choice! It is nice to take break and just sew something simple. 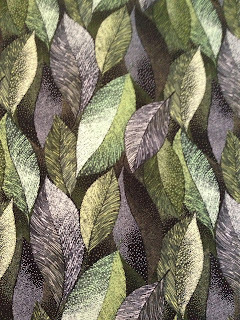 The leaf print really adds texture to the design. Hi, Judy. Luscious fabrics in this quilt--very pleasing color combination. I love how the leaves play along the rail fence pattern. Wonderful, Judy! Leaf pattern works really well. My very first quilt was a Rail Fence...November 1984, for a baby (my son) due in July 1985 (he arrived in June)...Thanks for a lovely memory. I know whoever receives your Rail Fence will be blessed! The leaf print really makes this an interesting quilt Judy. I think I will look at patterned fabric with a different eye for simple piecing like the fence rail.